Julie was born and raised in upstate New York. She married her high school sweetheart and accompanied him on his twenty-year career with the United States Air Force. One of his duty assignments was to Cheyenne Mountain Air Station in Colorado. She and her husband fell in love with the area and settled back in the Pikes Pike region after his retirement. Currently, Julie is a stay-at-home mom enjoying a career writing western historical romance. Throughout her younger years, Julie enjoyed writing and reading. She credits her love for romance to a friend her introduced her to the genre. Her inspirations for a writing career sprang from Judith McNaught’s flawless voice and Johanna Lindsey’s Malory family novels. Julie has penned seven novels and two short stories. Whenever she’s not writing, Julie enjoys spending time with her family, exploring Colorado and meeting other fans of the romance genre. Forced to flee his home in Chicago, Gage Cantrell shed his greenhorn ways and joined an outlaw band. He’s spent the last six years dodging bullets and a Pinkerton determined to bring him to justice. Now that Gage has settled for a spell in Revolving Point, Texas, hoping to win the heart of the woman he loves, his past is about to catch up to him. Trouble is, Debra doesn’t know about Chicago. If she’ll forgive his cowardice on that fateful night, he’ll finally know peace. That is if he can thwart the Pinkerton and send him packing—for good. Raised in the St. Louis orphanage, Debra Moore has known more hard times than good. Riding with her brother and Gage as they raided the west brought about a longing for a real home, and for Gage to return her love. She’s found a comfortable haven in Revolving Point and wants Gage to cease to his bandit ways and put down roots with her. But Gage has never been the settling type, and lately he’s been more secretive than usual. Something’s bothering him. She’s going to find out what that something is and convince him there’s more to life than the tomfoolery of outrunning a posse. If you could bring someone famous back from the grave, who would it be? John Wayne. I absolutely love him and his western movies. If you could project yourself back into the past, where would you go? To my grandmothers’ houses. Both were wonderful ladies and fantastic cooks. If you could be a TV member of any sitcom family, which one would it be? I’d love to be part of Everybody Loves Raymond. The Barones are exactly like some folks I either know or have known. What’s something that amazes me? Moms who do it all; work outside the home, cook, clean, take care of the kids. I honestly don’t know how they do it, or where they find the energy, but I admire and have a great respect for each and every one of them. Autumn. I used to like summer, but as the years pass, I can’t stand the heat. And winter is too cold. Autumn is a perfect blend of warm days and cool nights, plus I love scarecrows and pumpkins and the fall colors. And the little kids who come to my door trick-or-treating. In the car when a really good song come son. What animal/insect scares you most? Snakes. I hate them. Spiders are a close second, but those I can whack with a shoe. You walk into a room. What is your music entrance? Thank you for stopping by my blog today to check out this amazing author and her book! Always love hearing about the author behind the work. 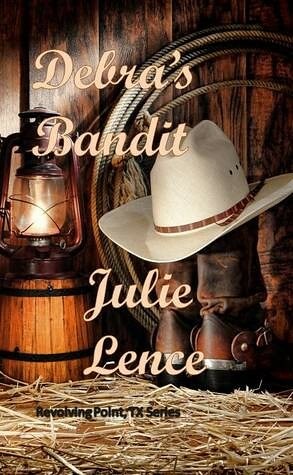 I’ve read Debra’s Bandit and felt like the characters where real people! Thank you for having me as your guest, Michelle. I enjoyed working with you and had fun answering the questions. Happy Holidays! I enjoyed having you! if you ever need anything else please don’t hesitate to ask you are always welcome on my blog! !